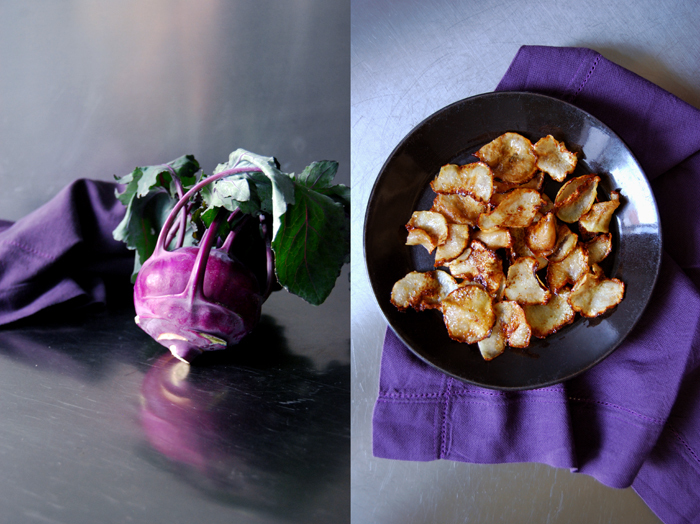 After I stared at this stunning vegetable, a glowing purple kohlrabi, for about five minutes, I could see them right in front of my eyes: sweet, caramelized kohlrabi chips! Thin and sticky with crispy edges! 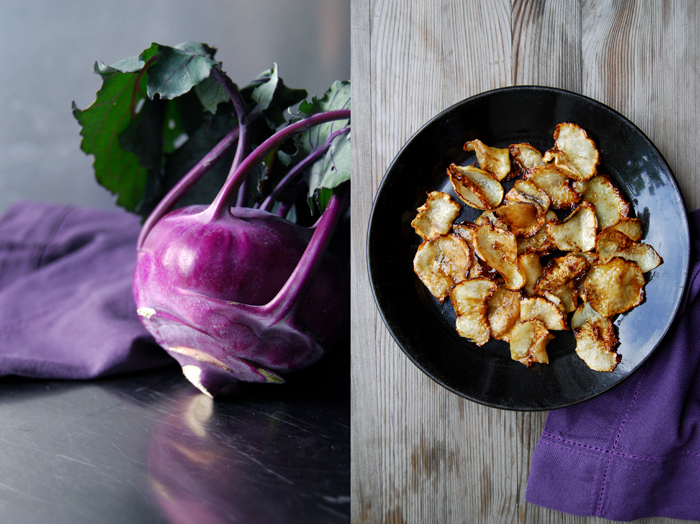 Normally I buy green kohlrabi as that’s what I find at the market most of the time and to be honest, there isn’t really a difference in taste, but the deep colour, somewhere between red, blue and the faded green of the leaves makes me grab this one whenever I see it. As soon as it’s cut and sliced there isn’t much left of its outstanding beauty but that doesn’t matter, the taste makes up for it. 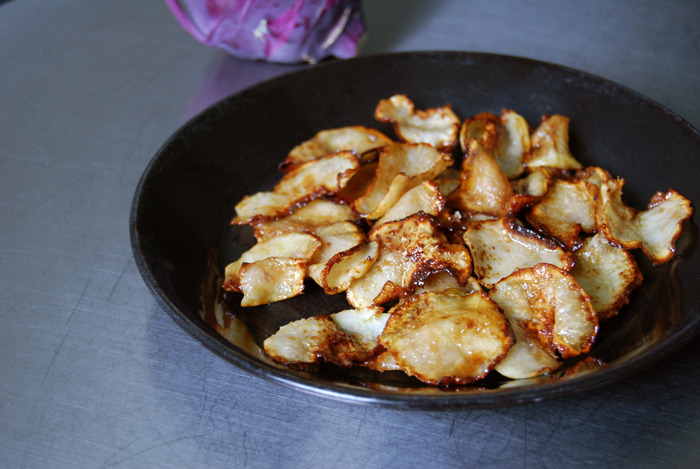 Especially when the paper thin slices turn into chips which combine the hearty taste of cabbage with the bitter sweetness of caramel. In a large heavy pan, melt the butter and sugar on a medium-high heat, add the vegetables and spread them flat next to each other. 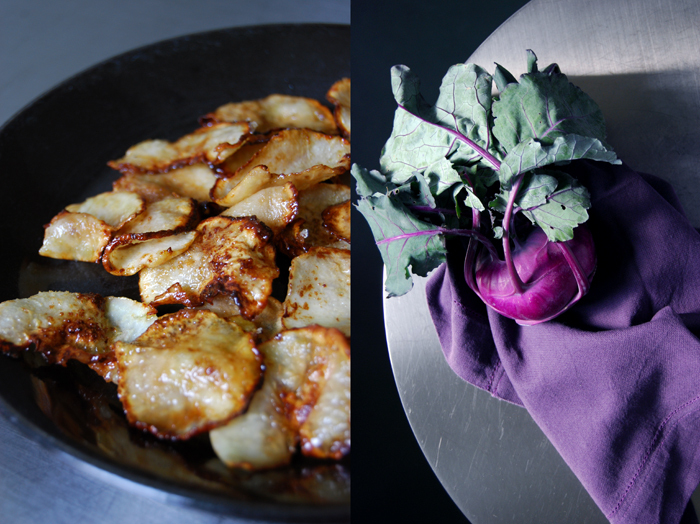 Cook for 2-3 minutes, turn and cook for another minute until golden brown on both sides. Take the chips out and spread them on kitchen roll for just a few seconds. Don’t let them cool on the paper or they will stick to it. Nibble cold or warm. the sweet angle… my wandering test kitchen mind is clicking with excitement. Thank you Jerry for the feedback! We enjoyed ours without any salt, they were so tasty and sweet, it wasn’t missing at all. But this is a personal preference. I’m happy you enjoyed the recipe! I will try it with spicy chili flakes one day, that’s a great idea!